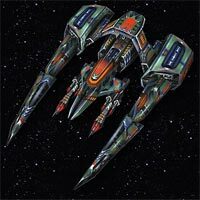 The development of more and more perfectly designed defence systems on planets cause the production of special ships to destroy them. 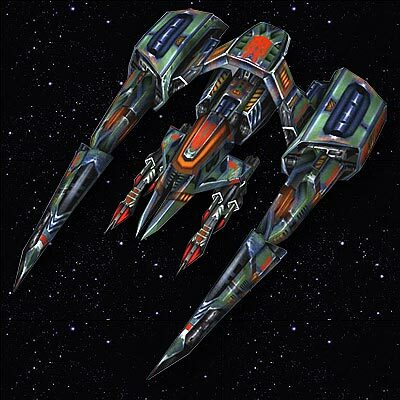 The Bomber is highly efficient against these defence systems, equipped with powerful plasma torpedoes. But there's the problem- the bigger body it makes it a easy target. That is why when designing it, the size is carefully calculated. As a consequence there is a lack of thick armor and also, the ship's shields are only partly distributed. Because of the lack of free space, a modified impulse engine is used, that unfortunately does not offer enough velocity for its large consumption of gas.The Bomber hits defence turrets with triple damage from the very beginning of the battle. Cargo: 500Attack: 7000 (vs. Ground defence х3)Ship hull: 90000Speed: 5000Gas consumption: 1000Cost: 50000 Metal, 25000 Crystals, 15000 Gas Weapon: Laser;Armor: 16% Heavy; Improvements in Factory: 11% per level. Each Bomber has 0.05% chance to destroy a level in a randomly picked building. The maximum chance is 50%.